4) A special Ameren pricing plan called Power Smart Pricing. WARNING: Right now, the regulated utility—Ameren—is still probably your best choice. *Note: Ameren price includes the Electricity Supply Charge and the Transmission Services Charge, both under the “Supply” section of bills. The price does not include the Purchased Electricity Adjustment (PEA) or the Renewable Energy Adjustment. The PEA can change monthly and is a credit or a debit. The Renewable Energy Adjustment is 0.196 cents per kWh. Alternative supplier offers are not impacted by the PEA, and they temporarily have a lower Renewable Energy Adjustment. False! Signing up is optional. If you’d rather keep Ameren as your supplier, you can. 2) An alternative supplier will protect me from Ameren rate hikes. False! Electric bills are divided into three parts: supply, delivery and taxes. While you might secure a lower supply rate with an alternative supplier, you won’t be protected from delivery rate hikes that Ameren gets before the ICC. Everybody pays those delivery rates, because the utility owns all the wires and will always deliver power to your home. False! Because Ameren owns all the wires, you will always pay it to deliver power to your home. 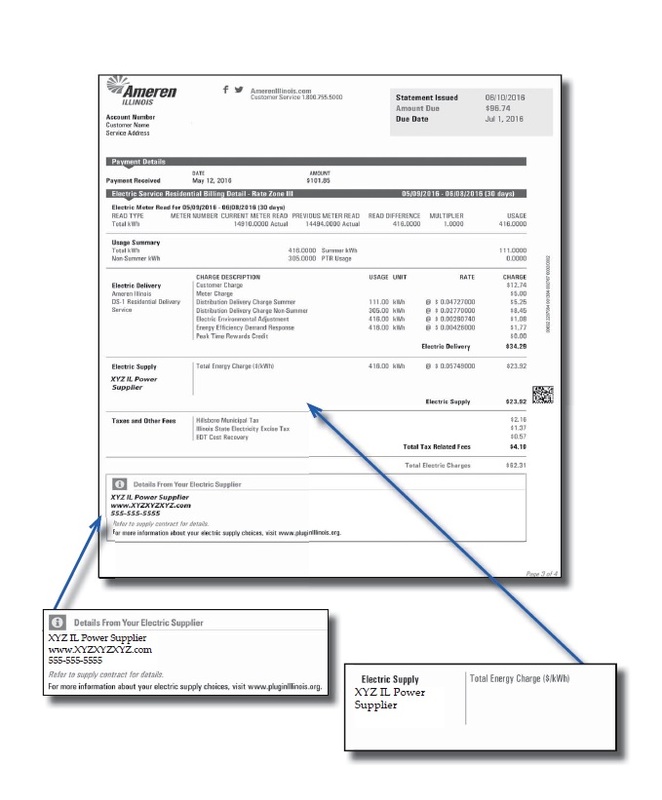 Suppliers include their charges in the supply section of your Ameren bills. Ameren’s Power Smart Pricing program: Charges a market rate that changes hourly, encouraging customers to put off heavy appliance usage until times of day when power prices are low. While not for everyone, this program has saved people an average of about 15 percent on the supply portion of their power bills. For more details, call Ameren, at 1-877-655-6028, or visit: www.powersmartpricing.org. Ameren’s Peak Time Rewards program: Gives customers an opportunity to save money without risk. By signing up, consumers are credited on their electric bill when they reduce power usage during designated periods when electricity is most in demand. For more information, call Ameren, at 1-844-787-7874, or visit www.peaktimerewards.com. On your Ameren bill: If you’re with another supplier, its name should be in the “Supply” section of your bill. You should be able to see the per kilowatt-hour price you’re paying with that supplier.